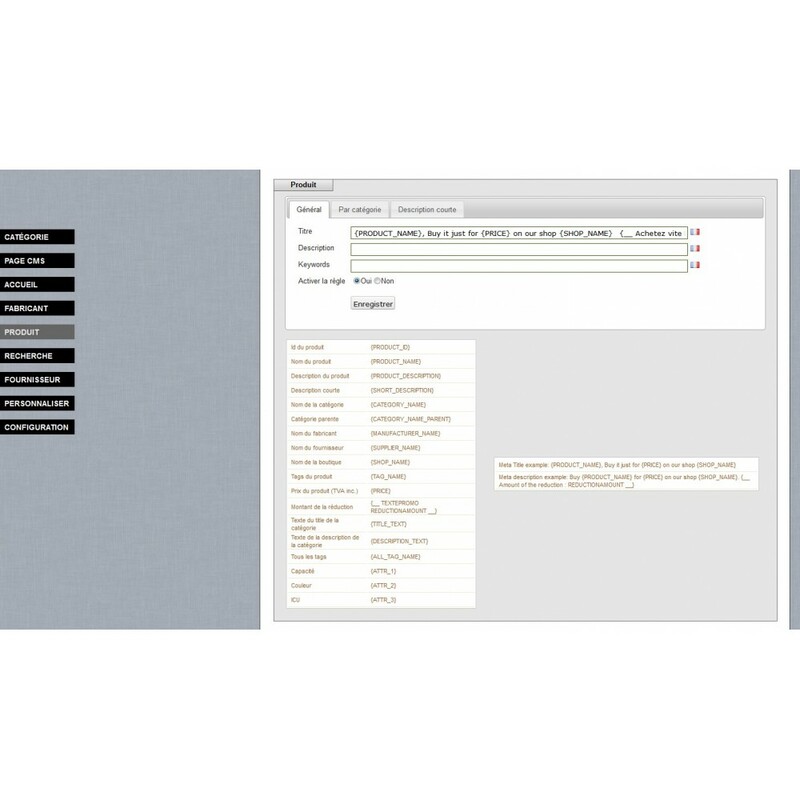 THE module to automatically and intelligently generate all your meta tags. This module is required for a good SEO for your online shop. You will gain a lot of time! Need to optimize your meta tags one by one to each of your pages. The module will generate automatically, intelligently. Once the module is installed and automatically generated meta tags, your SEO will improve: Better SEO = more traffic = more customers = more sales. This is the first seo module you have to set up! The only complete module to generate your meta titles, and your meta descriptions: pages for categories of products, your product pages, your CMS pages, pages of brands, suppliers of pages, pages of research. The Title tag is the most important meta tag to your ranking in the search engines, the choice has a direct impact on your positioning. The description tag is that it will encourage people to choose your site in the search results instead of that of your competitors. + meta keywords ! + short descriptions ! 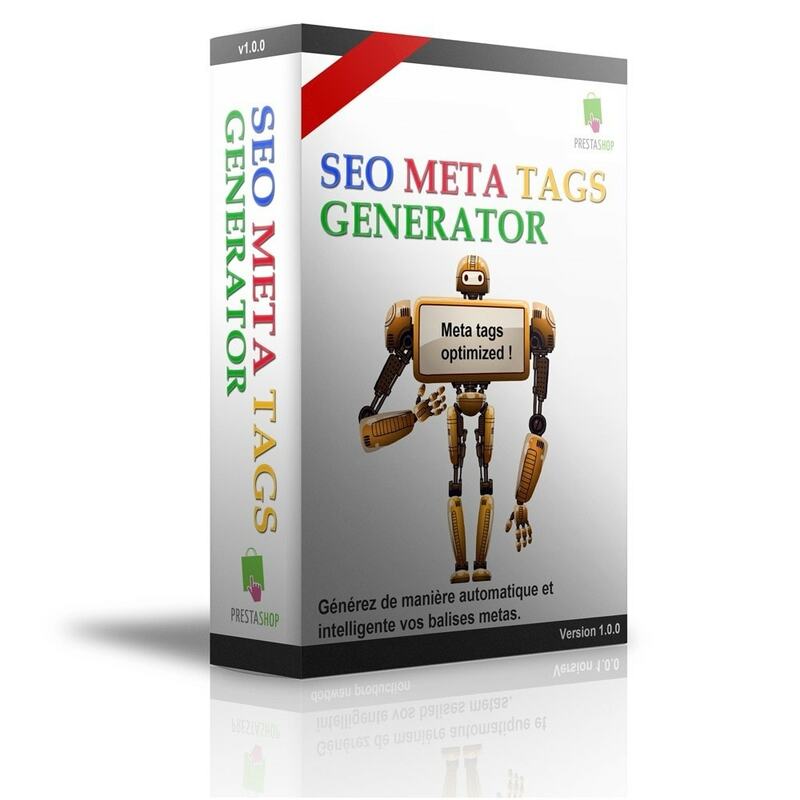 SEO Meta Tags Generator can automatically generate all the meta tags of your online store. 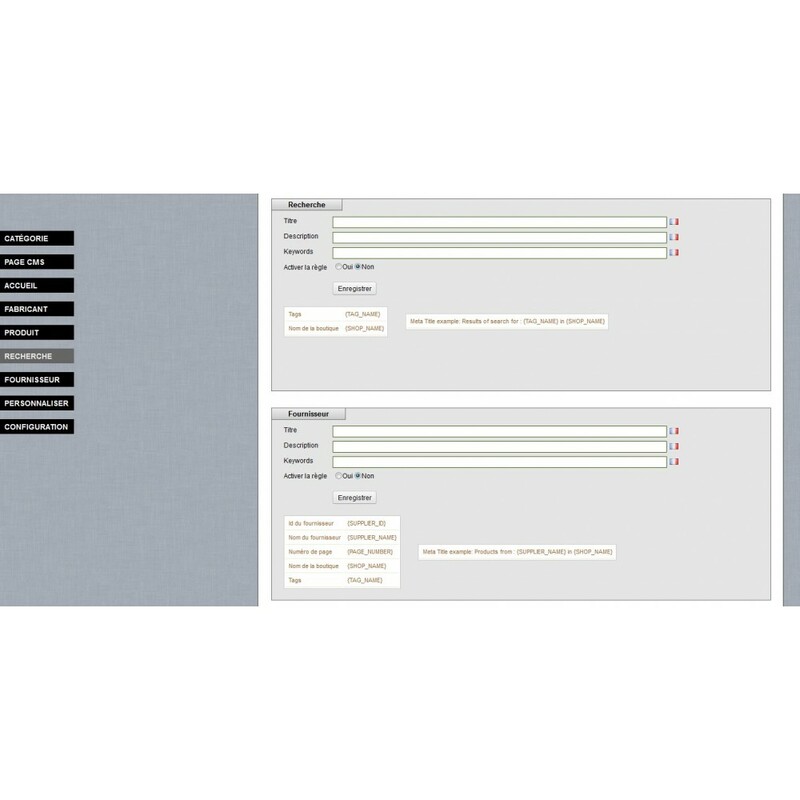 To do this, simply define your rules generations, it takes a few seconds, the module is very easy to configure. Automatically generate meta descriptions and meta titles. For all types of pages Prestashop: product categories, your product pages, your CMS pages, pages of the brands, pages suppliers, research pages. 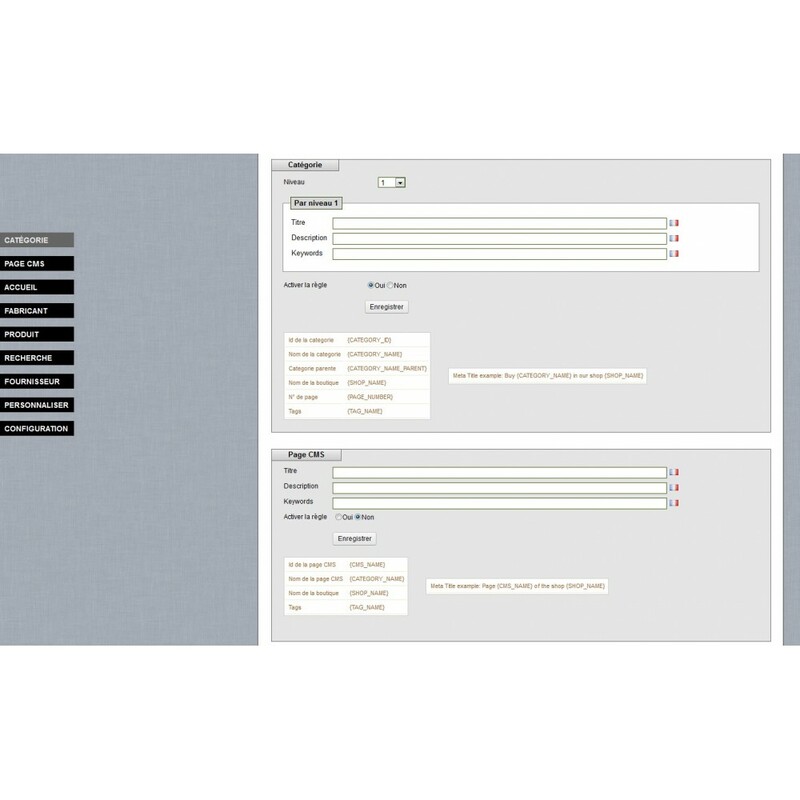 Managing multilingual shops: to generate different versions of your meta meta for each language. You can apply a different rule for each types of pages. You can manually customize any tag of your choice (for a product, category or other page ...). 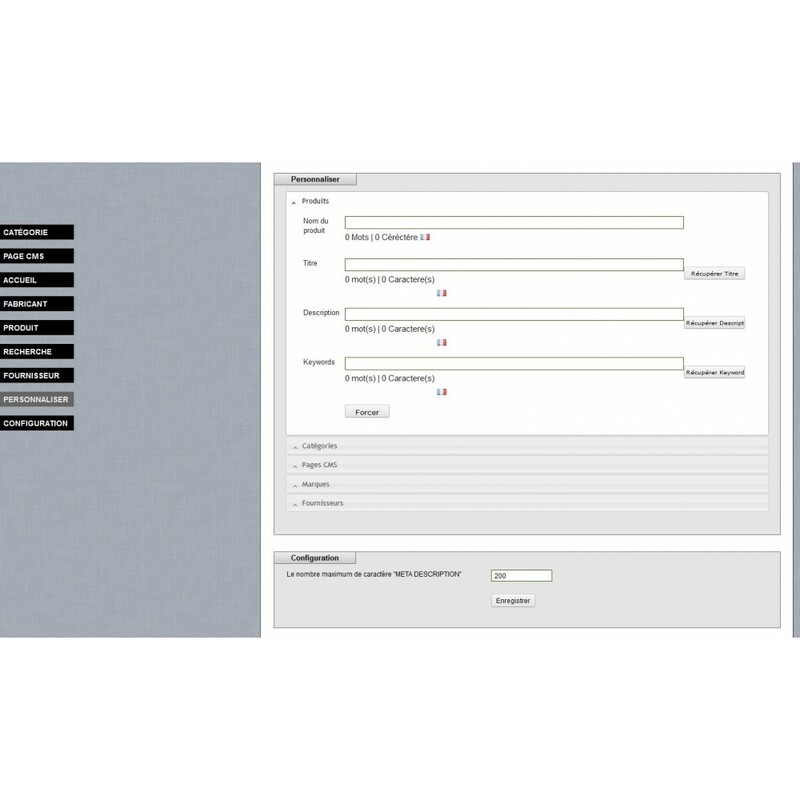 Possible to import one by one meta already written via interface prestashop. You can generate short descriptions of all your products in one click. Can automatically generate meta keywords tags. You can set a maximum number of character meta descriptions. You can apply a rule for products of a specific category. You can define a rule for each level of your categories. Category Pages: Sale + "Name the category" + the best price on "Store Name"
Product Pages: Buy a "name of the product" + discount + on the store "Store Name"
The client will find your shop more easily on search engines. Your site to search engines provide an interesting and useful description tag, which will generate more clicks to users. Your store will have a better SEO, it will generate more traffic, more customers, and therefore more revenue! Optimize the SEO of your shop, generating an additional single text for all of your product pages.